Nearly as fast as the Titan X at a better price point, the GTX 980 Ti is the new choice for high-end gamers. The ball is now in AMD's court. We all know the type: the ultra-cool guy that has the best hair, wears the right clothes, and drives the hottest car. The problem is that trying to make friends with such a person is difficult… and it will cost you. But did you know that the coolest guy in town has a little brother who's much more down to earth? Oh, he still dresses right and drives a nice car, but he’s not quite so ostentatious. His name is GeForce GTX 980 Ti, son of Nvidia and brother to the GeForce GTX Titan X.
There’s not a whole lot of surprise with the announcement of the GeForce GTX 980 Ti (henceforth the 980 Ti). We saw the writing on the wall as soon as the GTX Titan X was launched: “Great, here’s the halo $1,000 luxury GPU that most can only dream of owning; now show us something we might actually buy!” The same thing happened with the original Titan and the GTX 780 Ti, though this time there shouldn't be any instances where the less expensive part actually offers superior performance. There’s also no improved FP64 mode on Titan X, so saving 30 percent and getting roughly 95 percent of the performance is hardly a bad thing, but let’s not jump ahead. Meanwhile, we’re still waiting for AMD’s next-generation GPU to make the scene. That means that for the time being, the 980 Ti is going to be even more expensive than the already costly GTX 980. AMD’s Fiji GPUs can’t possibly come soon enough. Last time, when NVIDIA launched the GTX 780 Ti, it was intended to reclaim the performance crown from AMD’s just-released R9 290X, and the price of the GTX 780 dropped $150 in response. We’ll have to see what AMD has in store and whether they can help bring some balance—and much-needed competition—to the high-end graphics market in the coming weeks. Comparing the two GM200 cards, other than the drop in the number of shaders/SMMs, the 980 Ti looks a lot like the Titan X. It still has 96 ROPs and a 384-bit GDDR5 interface, though “only” with 6GB VRAM this time. We’re already seeing signs of 4GB VRAM being insufficient, particularly for higher resolution modes like 4K, but with very few cards sporting more than 4GB VRAM most games are unlikely to need 12GB VRAM. 6GB on the other hand, yes, thank you, we can definitely use that! It’s also important to note that there are none of the 3.5GB + 512MB segmented memory shenanigans of GTX 970 at play with the 980 Ti; this is a fully enabled GM200 chip as far as the memory interface and cache are concerned. That means in situations where games don’t need more than 6GB VRAM, the 980 Ti should be no worse than eight percent slower than the Titan X—and in many cases it will be less than that. We’ve already covered most of the other interesting tidbits for GM200 in the Titan X review. It has eight billion transistors compared to six billion in the GM204 (and 5.2 billion in GK110). The chips are divided into SMMs—“streaming multi-processors”—each of which contains 128 CUDA cores subdivided into four warp schedulers of 32 cores each. Each SMM also has 16 Texture Units (TMUs), a 96KB memory pool, and another 48KB of shared L1/texture cache. The main difference here is that 980 Ti disables two of the SMMs while keeping everything else in place. While the basic design of Nvidia’s first- and second-generation Maxwell parts is the same, it’s important to note that only second-generation Maxwell processors support several new features: DSR (Dynamic Super Resolution), third-generation Delta Color Compression, Multi-Pixel Program Sampling, VXGI (Voxel Global Illumination), VR Direct, Multi-Projections Acceleration, and MFAA (Multi-Frame Sampled Anti-Aliasing). HDMI 2.0 is also supported on second-generation Maxwell, which means you can do things like drive a 4Kp60 display without resorting to any compression algorithms. Most of these new features are targeted at high-end gaming, so while it’s unfortunate that not all Maxwell GPUs have the same feature set, in practice it’s not quite so bad—running a VR device off a GeForce 750 Ti wasn’t going to be a great experience with or without VR Direct, and 4K gaming is generally out of reach of even powerful GPUs like the GTX 970, never mind the 750 Ti. We'll look at some of the other new technology Nvidia is announcing today in separate articles, but here our focus is purely on the 980 Ti. There are some other interesting tidbits at play here. For example, even though the 980 Ti has fewer cores than the 780 Ti, the Maxwell 2.0 cores are more efficient. GTX 980 is already able to match or slightly exceed the performance of the 780 Ti with 2048 cores, so accounting for clock speeds the 980 Ti should be at around 15–20 percent faster than the GTX 980. In situations where the VRAM amounts come into play (e.g., at 4K resolutions), the performance delta will potentially be even greater. Nvidia claims that the 980 Ti is as much as 65 percent faster than the 780 Ti at 4K resolutions, and compared to the GTX 680 they’re claiming up to a 3x increase in performance. Those are lofty claims, and realistically, that “up to” phrase is pretty nebulous; on average, the increase will often be less substantial, except in cases where you run out of VRAM. 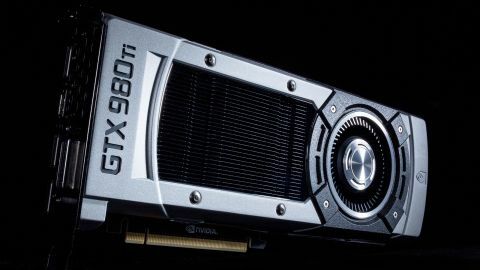 The GTX 980 Ti reference design retains Nvidia’s proven cooling solution from the Titan X and earlier GPUs. It has worked well and manages to provide good cooling without generating a ton of noise, so it’s no surprise to see it appear yet again. Unlike Titan X, however, add-in board manufacturers are free to experiment a bit more with 980 Ti, so while our test GPU looks exactly like Titan X, other than the silver shroud instead of black and the 980 Ti logo emblazoned on its side, we’re likely to see open-air coolers as well as blowers from companies like EVGA, Asus, etc. We’ve also updated our benchmarks a bit. In the interest of keeping things mostly consistent, we’ve kept all of the existing benchmarks from the Titan X review, but we’ve added two new games: Grand Theft Auto V and The Witcher 3. Both titles are quite demanding, and GTAV is interesting in that it will actually show how much VRAM the game needs to store all assets on the GPU. Hint: with all settings maxed (which is how we roll at Maximum PC), only 1920x1080 is able to fit within 4GB VRAM; 2560x1440 requires around 4.2GB VRAM, while 3840x2160 comes in just under 6GB. This should provide some interesting results with the different amounts of VRAM on the cards we’re testing. We’ve also started running 3DMark’s Fire Strike Ultra and Extreme tests, though the gaming results will continue to be our primary emphasis. Finally, we’ll be reporting both average and minimum (or in some cases, 97th percentile) values for the games we benchmark. Average frame rates are great for giving you a general idea of how well a game runs, but performance consistency is also important—a game that runs at 60+fps most of the time but drops below 20fps on occasion would provide a somewhat choppy gaming experience. The minimum frame rates will be particularly telling when it comes to VRAM limitations, where texture thrashing can occur on cards that don’t have enough memory. Enough talk. We know Titan X is a fast card, and there’s every reason to expect the 980 Ti will be a very close second. Let’s hit the benchmarks. OMG… graphs! Nine games and applications, three resolutions, and nine GPUs. Yes, that is a lot of benchmarks to run, but we like to be thorough. There’s a lot to digest here, with individual game results as well as the average performance across all tested games. We’ve separated the charts into two galleries: single-GPU comparisons and comparisons against our three SLI/CrossFire configurations. We’ll start with the single-GPU charts. Just as expected, the GTX 980 Ti is a force to be reckoned with. If you just look at the top graph, you'll find everything you really need to know about overall performance. The GeForce 980 Ti ends up being pretty darn close to equal with the more expensive Titan X, particularly at lower resolutions. How close does it come? The largest difference in average frame rates is less than five percent, and across all eight games tested it's less than a one percent gap. Minimum frame rates are slightly more in favor of Titan X, with an average difference of seven percent at 4K, but only 2-3 percent at 1080p and 1440p. If you want Titan X performance for $350 less, the 980 Ti delivers. For those with an older GPU like the GTX 770 (which is about 10 percent faster than a GTX 680), the GTX 980 Ti represents an astounding doubling of performance at our 1080p and 1440p settings; if you happen to run 4K games at maxed-out settings, we actually averaged more than a 3x improvement in performance. That’s mostly thanks to a couple of games that did very well—Tomb Raider shows a 4.7x improvement and The Witcher 3 shows a 5.8x improvement. Then again, both Batman: Arkham Origins and Grand Theft Auto V failed to run on the GTX 770 with our 4K settings, so in that sense the improvement is even better. Practically speaking, it means you can go from an unplayable single-digit gaming experience at 4K maximum quality on the 770 to a reasonably playable 30+fps experience. Of course, you can get far better 4K performance if you disable AA and turn a few settings down a notch. If you already have a good GPU, 980 Ti isn’t going to provide nearly as much benefit. Compared to the 970, it’s a reasonable bump in performance of 55-65 percent, but compared to the GTX 980 it’s a much smaller 20–25 percent improvement. The R9 290X continues to show its potential, especially at higher resolutions where on average it’s only 10 percent slower than the GTX 980. That makes the 980 Ti 35–40 percent faster than the 290X, but you could buy two AMD R9 290X GPUs instead of the 980 Ti and still have money left for lunch. That’s the difficulty Nvidia needs to overcome when it comes to convincing gamers to buy their latest “affordable” powerhouse. But since you can buy two R9 290X cards or two GTX 970 SLI cards for the price of a single GTX 980 Ti, it’s worth looking at how that actually plays out. Raise your hand if you were expecting the GTX 970 SLI setup to crush the GTX 980 Ti. Sure, there are definitely cases where the SLI 970 cards win, but there are also times when that single high-end GPU is the better approach. Batman and Witcher don’t appear to scale as well with multiple GPUs, but even in the best scenarios, the 970 SLI configuration is only about 20 percent faster than a 980 Ti. Overall, the average performance advantage of 970 SLI is a paltry 4–8 percent, depending on resolution, with higher resolutions scaling slightly better with SLI. 290X CF is at least a clear winner in every benchmark, with no instances where a single GPU beats the two Hawaii cores. AMD has some particularly strong showings at 4K, leading to an overall 30 percent performance improvement at that resolution over the newcomer 980 Ti. Note that at 1080p the benefits of CrossFire are often outweighed by greater CPU usage to hit high frame rates, so if you’re using a 1080p display, CrossFire and SLI probably aren’t necessary. However, looking at average frame rates only tells half the story; the minimum frame rate can be just as important. Minimum frame rates are also why we generally prefer a single fast GPU over two slower GPUs running in SLI/CF. There’s CPU and system overhead associated with SLI/CF, so while it can provide clear benefits to average frame rates, minimum frame rates will often drop. Case in point: We just mentioned that on average 970 SLI is roughly six percent faster than the 980 Ti and 290X CF is up to 30 percent faster. Switch over the minimum frame rates and the story changes: On average 970 SLI is almost 10 percent slower than a single 980 Ti—16 percent slower at 4K. 290X CF likewise shows an overall decrease in minimum frames per second of 10 percent, and over 20 percent at 1080p, where CPU overhead is creating a bigger bottleneck. It might seem a bit surprising how little impact the extra 2GB VRAM seems to have on performance, but minimum frame rates as well as the benchmarks themselves are the explanation. If a game doesn’t use more than 4GB VRAM at our benchmark settings, having more VRAM does nothing for you—it’s why the 12GB VRAM in the Titan X feels like overkill, at least for now. Since many of our games are a bit older, it’s no surprise that they don’t need more than 4GB—or even 3GB. 6GB is really forward looking, but it will become increasingly important over the coming year. GTAV is the poster child for being able to use 6GB VRAM, but it requires some pretty strenuous settings to get there. Max out all the Graphics and Advanced Graphics settings and run at 4K, and the VRAM use is very close to 6GB. That means all of the 4GB cards should show signs of thrashing, and they do. The R9 290X in particular has trouble, and while the 18fps of the 980 Ti is nothing extraordinary, the 4–5 minimum frames per second results for 290X (and 290X CF) show how bad things can get. We’ll be running some additional tests over the coming week, including power and noise testing, but there’s nothing particularly noteworthy to discuss in those areas. The 980 Ti has a 250W TDP, and it will make use of it. The cooler meanwhile continues to be the gold standard for a blower-style graphics card, which is really the only way to go (outside of liquid cooling) if you want to run 3-way or 4-way SLI. The two-word summary of the GTX 980 Ti is this: It’s awesome! We didn’t provide benchmarks of every game out there, but other titles exist where having 4GB VRAM can cause problems—Assassin’s Creed: Unity comes to mind. With the Xbox One and PlayStation 4 both sporting 8GB total RAM, we’re seeing many titles push beyond the 2GB mark that has been around for so long. Couple that with 4K displays and we’ve rapidly gone from 2GB being “enough” and 4GB being “future-proof” to a new level where at least 6GB is necessary if you want to enable maximum quality. Like the Titan X, the 980 Ti ensures you have enough VRAM, and then it tosses in a bunch of bandwidth and shaders as a bonus. But as much as we like everything about the GTX 980 Ti, we also have one other word of advice: Wait! Yes, the GTX 980 Ti performs better than any other GPU besides the Titan X, but AMD’s Fiji with HBM (High Bandwidth Memory) should be here within the month. We don’t have details on the memory configuration for AMD’s Fiji parts, and it’s possible they’ll stay at 4GB with HBM, but as the saying goes: The proof is in the eating of the pudding. Assuming you didn’t jump on Titan X when it launched, waiting another few weeks to see where AMD’s cards fall won’t hurt. It may end up faster than 980 Ti at a better price, it may be faster with a higher price, or it could end up slower but with a better price. Whatever happens, we can expect Nvidia to respond appropriately. Unless you absolutely have to upgrade right now, in which case the 980 Ti looks primed for the future. If the new GTX 980 Ti doesn't tickle your fancy, check out recent choices in our guide to the best graphics cards on the market.